The fourth of July is a remarkable day to one of the greatest nations in the world, it is the "Independence day of the United States of America". In the United States, it is a federal holiday which commemorates the adoption of the declaration of independence on the fourth of July 1776. It was a day independence was claimed from Britain and democracy was born. 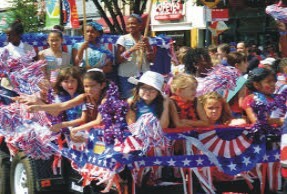 Events such as firework, parades, outdoor sports, barbecues are always experienced in such a day. The Fourth of July holiday weekend should be a time to celebrate with family and friends and not a time to spend in the emergency room or any form of clinic. According to the Consumer Product Safety Commission, about 230 people go to the emergency department every day during the month surrounding the July Fourth holiday with fireworks-related injuries alone. According to a medical expert, more than 50 percent of Independence day injuries are burns. Hands and fingers are the most injured body parts. Leave fireworks to the experts, and especially keep children away from fireworks. Sparklers may seem safe but actually burn at temperatures about 2,000 degrees, akin to a blow torch. According to Prevent Blindness America, more than 1,300 eye injuries were reported in the past year due to fireworks, almost double from the previous year. Fireworks can cause eye injuries including burns, both thermal and chemical, lacerations and deep tissue injury leading to vision loss. Half of those injured were not handling the explosives themselves but were innocent bystanders. Children are often at greater risk as they are not aware of the dangers associated with improper handling of fireworks including sparklers. Stay 500 feet away from fireworks, respect safety barriers, and do not touch fireworks that failed to detonate. If handling fireworks, wear protective eyewear, and if injured, seek medical attention immediately. Do not rub or flush eyes as that may make the injury worse. 26 million Americans suffer irreversible hearing damage from noise. Some fireworks can create 150-175 decibels of impulse or blast noise. At these high intensities, adults need to be a minimum of 50-60 feet away in order to prevent noise-induced hearing loss, and children need to be 160-200 feet away. Wear earplugs to protect hearing when noises are loud, because once permanent ear damage has occurred, hearing cannot be recovered. Use a ping pong ball-sized handful of lotion with an SPF of 30 or higher approximately 30 minutes before you go outdoors. Pay attention to covering the tips of the ears, the nose, the back of the neck as well as chest, arms and legs. Do not forget balm for your lips. And reapply every two hours. Drinking eight 8-ounce glasses of water a day is the general recommendation, with more needed if you are outdoors in the sun. Avoid dehydration by eating fruits and vegetables and definitely take time outs in the shade and cool temperatures to avoid fatigue. Follow these tips to have a healthy fourth of July experience. Happy Independence day!